Our friends, Transition Horsham, are gearing up for spring on their community allotment on neighbouring Chesworth Allotments. Everyone is welcome to help at the next two working parties: Saturday 4 April, 2-4pm and Wednesday 8 April 1.30-3pm. Plus their Open Day is coming up, Saturday 18 April 2-4pm. As Transition Horsham comments, “Come to our Open Day, talk to the team, drink tea, eat cake and have a tour of the allotment, no obligation. But do let us know if you are coming as the site is locked and we will need to let you in. 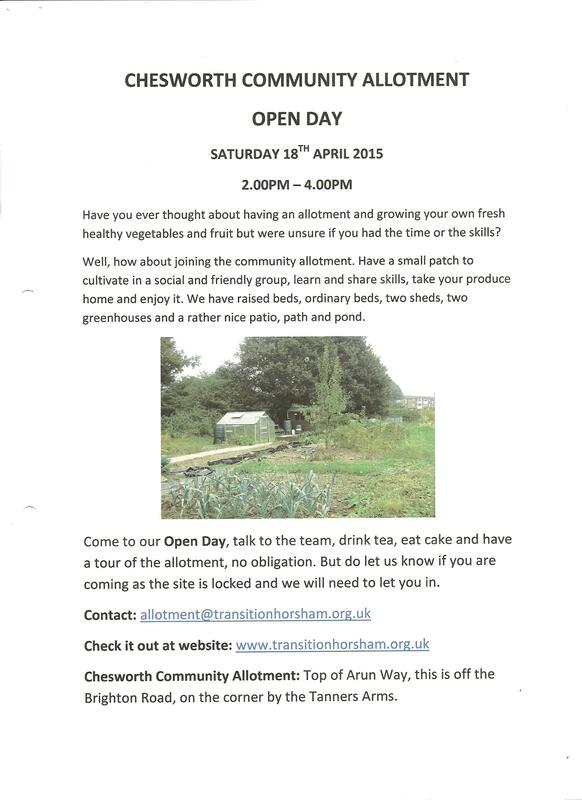 Contact: allotment@transitionhorsham.org.uk. Check it out at website: www.transitionhorsham.org.uk.” Also see the details below.